At the end of Leviticus 8, after Moses had washed Aaron and his sons, dressed them in their priestly garments, offered all the necessary sacrifices, smeared sacrificial blood on their bodies, and sprinkled them with holy anointing oil to consecrate (i.e., to make holy) Aaron and his sons in strict observance of the instructions of Yahweh, the priests-to-be had to wait seven days until their ordination could be completed (Lev. 8:32). At the end of this period of waiting, on the eighth day, Moses calls Aaron and his sons forward again to offer their first sacrifices before Yahweh. Although Aaron and his sons had laid their hands on the sacrificial animals in Leviticus 8, it was Moses who actually offered the sacrifices until this eighth day, when Aaron and his sons took up the responsibilities of the priesthood in full. 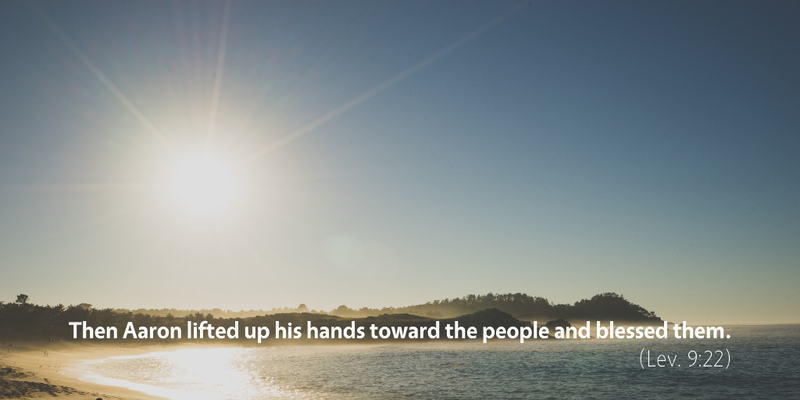 After making their sacrifices, Aaron lifted up his hands to bless the people and then accompanied Moses into the tent of meeting, and then blessed the people again (Lev. 9:22–23). At that point, the glory of Yahweh appeared, and fire from Yahweh consumed the sacrifices, indicating Yahweh’s approval of his new priests and causing the people of Israel to fall down before Yahweh in worship (Lev. 9:24). Aaron and his sons were duly ordained and installed to full duties as priests. But as I mentioned at the end of yesterday’s meditation, the exclusive priesthood of the sons of Aaron was only a temporary arrangement. God eventually raised up a new priest from a different priestly line altogether—a priest who offered himself, once for all, as an eternal sacrifice for God’s people. That is, God appointed his Son to be our great high priest forever after the order of Melchizedek, not Aaron (Heb. 7). Furthermore, God removed the office of priest as a position of leadership under the new covenant. The only ordained offices of leadership in the new covenant are that of elder and deacon (1 Tim. 3), not priest. But that doesn’t mean that priests no longer exist. Rather, God has commissioned all believers to serve as priests: “you yourselves like living stones are being built up as a spiritual house, to be a holy priesthood, to offer spiritual sacrifices acceptable to God through Jesus Christ” (1 Pet. 2:5). In the new covenant, we are called as priests to bring true worship before Yahweh—the sacrifice of praise (Heb. 13:15)—and also to offer ourselves to God as living sacrifices (Rom. 12:1). We do not and we cannot atone for the sins of anyone—Jesus Christ alone atones for sin through his sacrifice on the cross—but we are nevertheless called to a unique position of nearness to Yahweh to worship him with our praise and with our lives.